Musée Héritage Museum: St. Albert heritage sites opening for the summer! The St. Albert Heritage sites open this weekend and we invite you to drop in and visit! We look forward to a busy summer season at the Father Lacombe Chapel and St. Albert Grain Elevator Park! It's the beginning of another great summer at the Father Lacombe Chapel, situated atop Mission Hill on St. Vital Avenue in St. Albert. 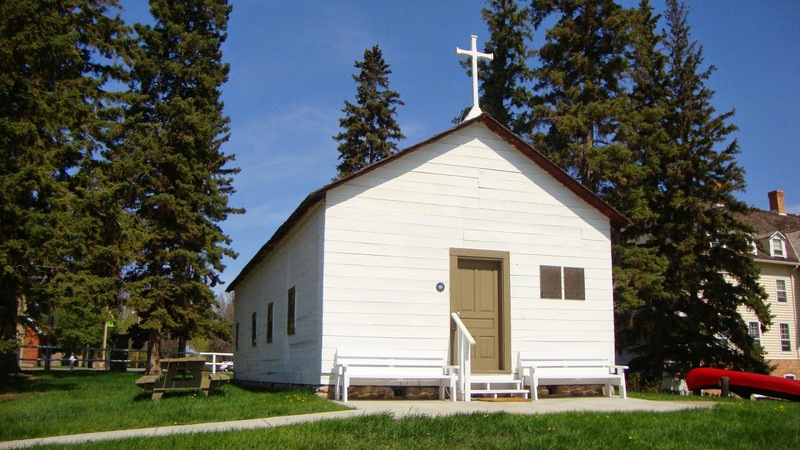 This chapel, the oldest building in all of Alberta, was constructed in 1861 by Father Lacombe and Métis settlers to serve the newly established St. Albert Roman Catholic Mission. The chapel has been restored to what it looked like in the 1860s. Drop by and have our interpreters take you back in time by showing you around Mission Hill where you can visit the crypt of Father Lacombe and Bishop Grandin, discover the grotto and take a walk through the cemetery, which is the resting place for some of St. Albert's earliest settlers. Join us over the summer break at our summer events, to enjoy some bannock, stories of St. Albert’s past, and above all else some good old fashioned fun! For 2014 our special events include Canada Day on July 1st, Taste of the Past on July 20th and Mission Hill Day on August 17th, all events run from noon until 4pm. Hours of operation, from May 15th until Labour Day, are seven days a week 10 am to 5 pm. We look forward to seeing you at the Father Lacombe Chapel this summer! On Saturday May 17th, 2014 the St. Albert Grain Elevators officially open for the 2014 season! Each week we open our gates to the public Wednesday through Sunday, and holiday Mondays, from 10 am until 5pm. Our friendly staff will be on hand to welcome you to our historic grain elevators, and our 1920 era replica train station. Join us this year each Thursday for crafts, traditional games, and refreshing lemonade. Our annual Dominion Day and Harvest Day festivities will be particularly exciting, so stay tuned for regular updates! 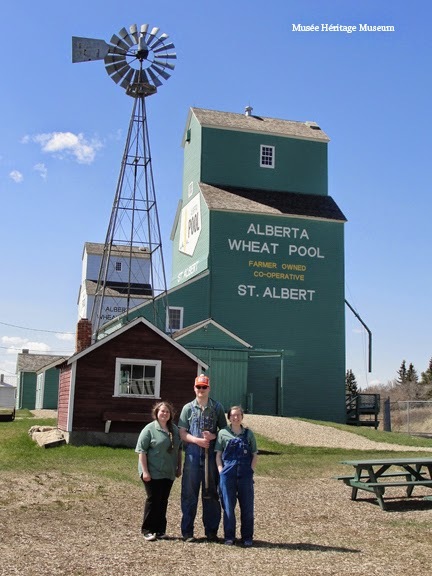 Janel, Curtis, and Gwen, our St. Albert Grain Elevator Park interpreters for this season. Our majestic elevators have stood sentinel over St. Albert since 1906 when our silver Brackman Ker elevator was completed, joined by the Wheat Pool elevator in 1929. Both these 90-feet structures are open to the public, accompanied by one of our three knowledgeable interpreters. In addition to discovering our remarkable agricultural past, step into the 1920s by visiting our replica train station. See how the station agents lived, try your hand at the specially designated Railway Morse code, and find out why the rail lines were so important to the development many communities all over Alberta, like St. Albert. Drop in a check out the historic sites of St. Albert, Alberta this summer! We look forward to meeting you, showing you around and sharing the history of this community with you, your family and friends. I get a chance to go the St. Albert with collage fellows before long time through the bus tours. During our stay there we visited the Father Lacombe Chapel and St. Albert Grain Elevator Park! It is situated on the bank of the picturesque sturgeon river and tells of the natural and cultural history of St. Albert and district. However, Lovers of history will find a trip to this park extremely fulfilling.